Much like today's video-enabled DSLRs, the Litepanels MicroPro Hybrid Kit bridges the worlds of video and still photography by combining a continuous light source with a portable flash. This compact, highly versatile unit uses proprietary LED technology to deliver beautiful, soft light that uses minimal power, never gets hot to the touch, and can be dimmed or color corrected to suit your needs. Emitting a 50W tungsten-equivalent beam in Continuous Mode--or a 400% brighter burst in Flash Mode--the MicroPro Hybrid can be used as a direct, on-camera light source (using the included hot shoe ball mount) or mounted on a stand and used as flash or fill. Running for up to 1.5 hours on 6 AA batteries, this light makes the perfect complement to any DSLR video kit. At the top of the MicroPro Hybrid housing is a convenient integrated dimmer dial that puts instant 100% to 0 dimming with minimal color shift right at the operator's fingertips. Output is flicker free and heat free and remains consistent. For more versatility, an integrated filter holder allows for work with the three included color/diffusion gels. An integrated filter holder on the back of the unit allows for carrying extra gels. To enable the strobe function, simply plug in the included Strobe Sync Cable. Litepanels MicroPro Hybrid produces 1.5 hours of continuous output from optional 6 AA batteries or 5-6 hours from Energizer e2 Lithium cells. It generates almost no heat, so it's remarkably easy to handle. And the system can be run off of either standard or rechargeable batteries. Power can be supplied optionally through a convenient 5-16V input jack located on the back of the unit, which accepts an optional Litepanels AC power supply, part number 900-5000 (not included). The compact, low-profile Litepanels MicroPro Hybrid head is ideally suited for mounting on a DV or DSLR camera. Measuring just 5.5 x 3.75 x 1.5" (14 x 9.5 x 3.8 cm), the head weighs just 10.5 ounces (300g). With a handsome black finish and sleek design, it is a professional-looking addition to any camera. Litepanels MicroPro Hybrid comes equipped with a Ball Head Shoe Mount with 1/4"-20 thread, featuring an adjustable tilt mechanism and locking handle. To allow for multiple configurations, it may also be mounted on the optional base plate for off-camera usage, or on an extension arm. MicroPro Hybrid Kit is rated 3.4 out of 5 by 11. Rated 4 out of 5 by BlackkWire Kevin from Great Performance Meh quality The light is nice and bright for video usage and the built in flash capability isn't bad. It cant replace a normal flash in my opinion (I have the 470EX). Its still great to have the built in flash capability though since you dont want to hav to redo your rig to change out the flash and in most cases it will provide enough light to work as a good flash. The biggest complaints are that it looks pretty cheap as far as plastics go and the included flash sync cable barely made it and the connector is a little loose on my Canon 7D. It needs to be a few inches longer. Other then those complaints over all its a great product. Rated 2 out of 5 by Mark from You've got to be kidding I gave this only two stars because if you factor in the overall areas to evaluate, the cost of this unit leaves one wondering how a manufacture could get away with it. The performance seems to live up to the hype and I am one to agree. However, given the fact this unit is made of very inexpensive materials and rather low-tech engineering, the price is just too ridiculous for me to rationalize. This unit will at some pont be accidently dropped or crushed by other gear and it is my view this cheaply made unit cannot withstand it. Then there's the fact no AC adaptor is included. Give me a break, an adaptor cost nothing and to pay almost $ for this and not even be given an AC adaptor is just wrong. What really powers this unit is the batteries you supply. 6 in all and if used at full power means you'll be spending a small fortune on batteries just to use it. THis unit should include a built in rechargeable battery with the option to use your own in emergencies. I'm a manufacturer and I know this unit cost next to nothing to make. My thinking is this company uses it's huge profit margins for advertising to generate even more sales. Hey, you can't knock this company if people are foolish enough to drop $ on this cheap piece of plastic technology. I don't even think that if they included the adaptor it could convince me to buy this again. If this was built of a light-weight, durable material, had a built in rechargeable battery and included an adaptor, the price would almost entice me to keep it.I know a rip off when I see one and I will bet those who buy this for the performance only will be happy for a while. At least until the product begins to fall apart. The company has a limited one-year warranty. That's not what I'm worried about. It's beyond this warranty period that really concerns me. Rated 4 out of 5 by Mattynabib from Fantastic portable light! I just got one of these to augment our Lowel tungsten light kit. I'd been trying to use the Tota for a hair light, but the darn thing is just too hot and bright in the spaces I usually shoot. The Micropro has come to the rescue, giving me easy placement, the right amount of brightness (dimmable) and a tungsten filter that brings the color close enough to the Lowels that I don't need to mess with it. Great little kit! I just wish the batteries lasted longer and that it CAME with an AC adapter... I still have to buy it separately. Rated 3 out of 5 by Anonymous from Convenient flash AND video light VERY cheap plastic, so it's not too mobile, but the protective soft case is nice quality. Would rather have had a good plastic, than cheap plastic and a good carrying case! For a fixed application this is a good solution. I am using it to light a small corporate studio where I film AND shoot portraits. The LED is cool, so the small space is bearable. And it is extra lighting in the room. Good size, more than I want for on-camera, but it is light,... and did I mention CHEAP plastic? Rated 2 out of 5 by Sats 1st AC from Meh. Bought this light along with a Dedo Ledzilla to compare the two. Output is comparable with the Dedo at medium flood, the Litepanel is a little more green in color. The Dedo is far more modular and useful and only a bit more expensive. The flash function does not work very well with my 7D. The sync cable is very loose, and the Panasonic battery plate actually covers the sync cable port and display light! Had to drill two holes in the battery plate to make it work. Haven't noticed the flash going off twice per shot, as a previous review has claimed. But the sync cable has to be firmly inserted or the flash won't fire. Also, it is a dumb flash and won't communicate settings with the camera. So I think if you need a flash for your DSLR, just get real flash, you'll be happier. So now that the flash is not useful, how does the Micro Pro handle as a continuous light source? It does put out an impressive amount of light (if a little green) and it works with my generic Panasonic batteries with the accessory battery plate. And the dimmer switch is nice. To get it to continuously dim, you need to turn it all the way up, then dim down. Not a big deal. When used as an on camera light, it is surprisingly sourcy. The opal diffuser doesnt help much, you really need to put a large diffuser bag around it to make it wrap. It's usefully as a little nook or edgelight either handheld with a 1/4-20 baby pin adapter or a Noga arm. Build quality is very plasticky. Also, the circuit board and wires are exposed thru the vent holes in the sides, so not good for use on location. It really is overpriced for what it is. The Litepanel Mini is far better light, but quite a bit heavier. The supplied hot shoe mount is well made on it's own, but not a good complement to the unit; the light easily comes unscrewed and flops around. This is one of the few cases where a quick release 1/4-20 system like the 16x9 cinelock will improve things. Overall, I am not a fan. Get the Dedo Ledzilla instead, you'll be much happier. Rated 3 out of 5 by Anonymous from Great idea, major limitation for events It should be disclosed that this unit will fire twice. It's not a factor at 1/125 but I sometimes shoot events where I want to balance low ambient light with flash and at 1/4 or 1/2 of a second, there are two pops. Handheld shots with people are unusable. On the plus side, it's great to have a unit that can do both strobe and continuous in one small lightweight package. Rated 4 out of 5 by Anonymous from This thing Rocks! 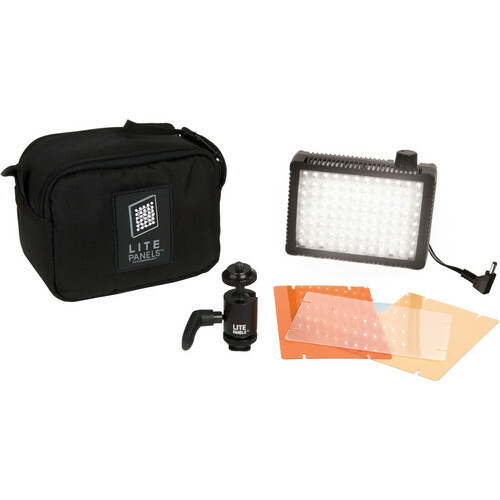 It's pretty easy to use and it's great when using it with your HDSLR using the light for video and having a little extra punch for the still shots, the gels came in very handy and now I never travel without this light in my kit. Rated 2 out of 5 by jim from Fader fails after 8 months of use After less than a year of minimal use the fader simply failed. Even with the 1/4 CTO gel the light seems to have a magenta cast to it.